Though my time in New York for Fashion Week was really quick, I had a blast as usual. It’s such a busy few days, but I always leave feeling inspired. Especially when it comes to fashion and incorporating new styles into my own wardrobe, whether from presentations, runway, or street style. Most of the trends are too much for me, but there are always a handful of staple trends I want to come home and try – and then share with you guys! This year, one of those trends was something I was really excited about, because we all know I love my sneakers. 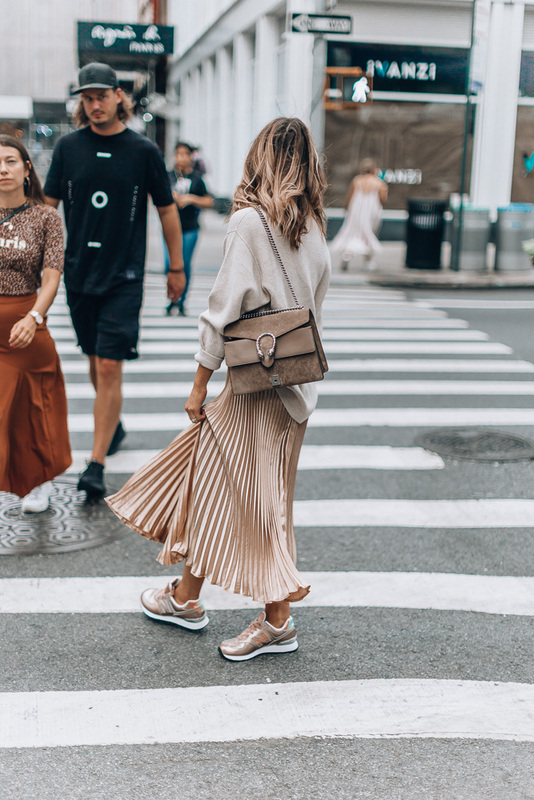 Instead of the dad sneakers that we saw explode last year, this year’s street style was all about metallic sneakers. I had actually spotted this trend before leaving for New York and I was so happy to grab these gold New Balance sneakers to pack with me. I scored them on eBay after not being able to find a lot of inventory on metallic sneaks elsewhere, and I’m obsessed! eBay is actually one of my first stops when shopping, especially if I’m looking for a particular style or clothing item. It’s a lot easier to shop than heading to a bunch of sites since they carry so many brands. The prices are always incredibly reasonable, too. 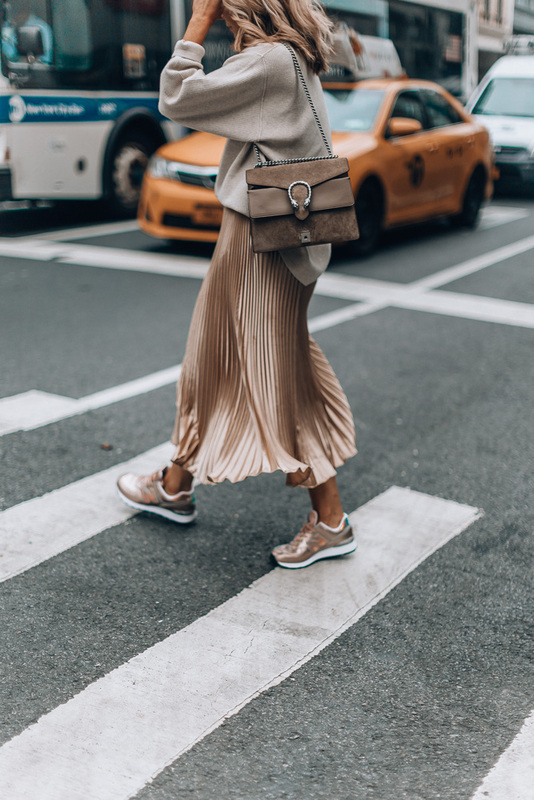 I thought these sneakers would be cool mixed in with my pleated metallic skirt, and I’ve gotta say, I love how this look turned out. I paired the gold with a relaxed, neutral turtleneck on top to even things out. It’s very much me while pushing the envelope a bit (but still within my comfort zone). And I will say, I looked a lot more comfortable than a lot of the girls running around in heels, haha. 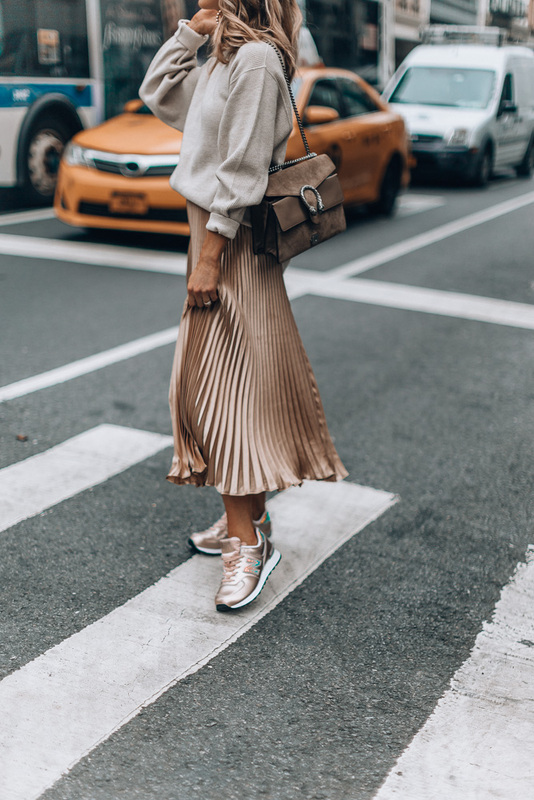 I can’t wait to wear this metallic sneaker trend throughout the rest of the year and even into spring, so you’ll be seeing these more. Are you into the trend? Let me know! A big thanks to eBay for sponsoring this post! YES! Definitely love how the look turned out and I’m so into metallics (especially for the autumn season). Great post! I love this outfit and how the skirt and sneakers match. That metallic is just gorgeous. Although I have to ask, did it felt uncomfortable shooting with that many people around?